"There are reasons that museums ask folks not to touch things"
One man visiting the National Watch and Clock Museum in Columbia, Pennsylvania, just couldn't resist touching a sculpted, wooden clock hanging on a wall. After he touches it repeatedly, it crashes to the ground, breaking into several pieces. The man and a woman accompanying him are seen trying to fix the shattered clock, before they walk away when they can't piece it back together. The museum isn't pressing charges against the pair, but instead wants to educate visitors on why it's important to follow the rules. The museum director also says there are more problems with adults than children with touching objects. The National Watch & Clock Museum in Pennsylvania decided it was time for a teachable moment when surveillance cameras captured a guest touching a rare modern clock earlier this week and accidentally knocking it off the wall. The museum shared the video on Instagram and YouTube, reminding visitors that there's a no-touching rule at the museum for a reason. "This is why we beg visitors not to touch museum object. #museumfail #museums #visitorfail #clock #timepiece," the caption on the Instagram video reads. 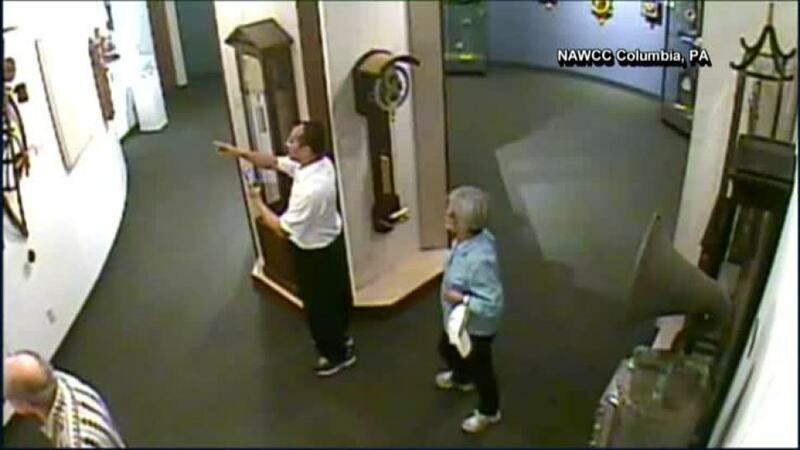 The video shows a man and a woman who visited the Columbia, Lancaster County, museum on Tuesday admiring a wooden sculpture clock created by artist James Borden for a few seconds before the man gets bold and decides to try to move the weights on the clock. Museum Director Noel Poirier said he and the museum staff who've watched the video several times think the man was probably trying to see if he could get the timepiece to run. Some of the roughly 1,500 clocks that are on display at the museum at any given time don't constantly run. "Once he pulled it up a little too high, that weight came off track and the heavy weight came down, hit the clock, knocked the clock off the wall, so then you see the results," Poirier said. "I think what he was trying to do was raise the weight up because I think he thought that would make the clock run." In the video, the clock falls from the wall, and pieces scatter on the floor. The man picks up the clock itself and tries to hang it back on the wall, but then leans it against the wall before he and the woman walk away. Poirier said that despite media reports saying the man ran away to try to go unnoticed, he actually went to find a museum staffer so the clock's parts could be properly cleaned up. Poirier said museum curators are happy to make any clock run should a curious visitor want to see how it works. But they prefer that visitors not take matters into their own hands. "Apparently this visitor really wanted to see this one run," Poirier said. "For us, it's a learning opportunity for folks because there are reasons that museums ask folks not to touch things." Poirier said in the roughly 10 years he's worked at the museum, this is the first time he can recall a visitor accidentally breaking something. People touch things all the time, though, he said. "There are people who touch things in museums regardless of what you do," he said. "Most times, it's adults. People think it's children, but it's really not." Borden, the artist who sculpted the clock out of wood, donated it to the museum's collection of some 13,000 objects in 1994, Poirier said. Fortunately, he said, the clock is fixable, and most of its repairs can be done in-house at the museum. He said the clock should be back on display in the next few months.